Having gone wild in the ethnic aisle on Saturday, we went a bit wild in the kitchen later on and ended up with rather a lot of leftovers, some of which Stephen took for lunch today. 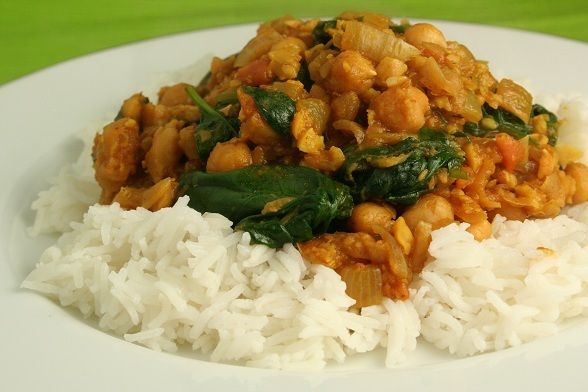 In order to use everything else up this evening, we made a quick chickpea curry, following this recipe. It was very quick and easy to put together which worried me slightly but, after a weekend of intensive cooking, I was happy for something straight-forward. The dish did suffer for this though and while it was edible, it didn’t have a huge depth of flavour. I don’t think I’d cook it again but it did fill us up and helped to empty the fridge.